We’d love your help. Let us know what’s wrong with this preview of The Book of Unknown Americans by Cristina Henriquez. A dazzling, heartbreaking page-turner destined for breakout status: a novel that gives voice to millions of Americans as it tells the story of the love between a Panamanian boy and a Mexican girl: teenagers living in an apartment block of immigrant families like their own. After their daughter Maribel suffers a near-fatal accident, the Riveras leave México and come to Ameri A dazzling, heartbreaking page-turner destined for breakout status: a novel that gives voice to millions of Americans as it tells the story of the love between a Panamanian boy and a Mexican girl: teenagers living in an apartment block of immigrant families like their own. To ask other readers questions about The Book of Unknown Americans, please sign up. When does this book take place? At first I thought it was 2014 because of some of the cultural references Mayor makes, but then he says he remembers being sad on September 11th. If he was old enough to process September 11th, there's no way he'd be only 15 or 16 in 2014. Also, there's one character that says she opened a theatre company in 1971 and now says 20 years later she's 50 years old. Siobhan It takes place from 2008-9, which you can tell from the election references (as well as the economic ones). Was this originally written in Spanish or English? What struck me most about this novel is the structure whose purpose becomes clear with the last chapter. It is quite interesting and poignant. This novel is a reminder of how everyone who comes to the United States brings a complicated storyw ith them. In The Book of Unknown Americans, immigrants from México, Venezuela, Guatemala, Puerto Rico, etc. live in an apartment complex in Delaware. Though they come from all over the Spanish speaking world, they have more in common than they do not and th What struck me most about this novel is the structure whose purpose becomes clear with the last chapter. It is quite interesting and poignant. This novel is a reminder of how everyone who comes to the United States brings a complicated storyw ith them. In The Book of Unknown Americans, immigrants from México, Venezuela, Guatemala, Puerto Rico, etc. live in an apartment complex in Delaware. Though they come from all over the Spanish speaking world, they have more in common than they do not and they form a community--something of a home away from home. Arturo and Alma Rivera have moved from Mexico so their daughter, Mirabel, who suffered an accident on Arturo's construction site, can get the help she needs. As Arturo and Alma try to make sense of their new life, while keeping an unbearably close eye on their daughter, Maribel is befriended by Mayor Toro who lives with his parents in the complex. Maribel remarks, as their friendship deepens, that Mayor is the only one who sees her and believes she can do anything. Henriquez chronicles their friendship and budding romance with real tenderness and makes it seem like anything is possible with young love. There are parts of the novel I wish were more fully fleshed out. Interspersed with the main story are testimonials from other residents in the apartment complex and I wanted to know more of their lives. I wanted them to have a more significant role in the story because they were so vividly drawn. Maribel Rivera is a normal teenaged girl in Patzcuaro, Mexico when one day she goes with her mother to her father's work site and suffers a traumatic brain injury. No longer the prize of Patzcuaro, Maribel retreats into a shell, suffers headaches, and can not complete even the most basic school work. Her parents Alma and Arturo Rivera would do anything for their daughter, look up schools for special needs children in the United States, and leave the only life they knew behind and move to Wilming Maribel Rivera is a normal teenaged girl in Patzcuaro, Mexico when one day she goes with her mother to her father's work site and suffers a traumatic brain injury. No longer the prize of Patzcuaro, Maribel retreats into a shell, suffers headaches, and can not complete even the most basic school work. Her parents Alma and Arturo Rivera would do anything for their daughter, look up schools for special needs children in the United States, and leave the only life they knew behind and move to Wilmington, Delaware so Maribel can attend Evers School. Alma and Arturo have a tough time adjusting to life as immigrants, the primary barrier that they have difficulties learning English. One of the reasons why they do not speak English is that they moved to the Kirkwood Apartments managed by Fito Angelino and all the tenants in the building are Hispanic. Not surprisingly, the primary language of communication is Spanish because it gives the immigrants a safety net where they can be themselves as opposed to the lower class people they now are in the world at large. The first friends the Riveras meet are the Toro family, who live in the same building. Henriquez tells half the chapters from the point of view of Alma and the other half from the point of view of Mayor Toro, a boy the same age as Maribel who falls for her immediately. While Alma is expectantly overprotective of Maribel, Mayor gets her to communicate and becomes the only person who understands her. As the friendship develops, so does the relationship between the Rivera and Toro families. Interspersed in the novel are testimonials from all the immigrant residents of the Kirkwood Apartments where the Rivera and Toro families live. All of these people came to the United States seeking a better way of life, and even though they might not have gained the life they originally sought out, for the most part the immigrants are happy they came. The primary example is the Toro family who fled Panama during Noriega's regime and has been living in Delaware for 15 years. The father Rafael works as a line cook in a restaurant, the family becomes US citizens, the older son Enrique receives a soccer scholarship to the University of Maryland, and the family buys a car. They feel that even though Panama has gotten better, they would not have had the same opportunities there as they would have had living in the United States. This sentiment is shared by the other people in their building, the Riveras included. The people in this book are the Unknown Americans- a photographer, a small business owner, an army vet, a line cook, parents seeking better lives for themselves and their children. Over the course of the book even Maribel improves in both her school work and long term outlook on life while Alma with the help of Celia Rivera learns rudimentary English. Henriquez paints the United States as still being the land of opportunity for legal immigrants in a post September 11 America. Of course there are still those white supremacists who wish all the immigrants regardless of status would go back where they come from. Henriquez touches on this as a subplot in the novel with the character of Garrett Miller. At first it appeared that he only desired to bully Maribel and Mayor but his character goes much deeper than that. Despite people like the Millers, however, the immigrants in this book appear to enjoy their day to day life as Americans. According to our government, every American who earns $50,000 a year contributes $43.78 to welfare and food stamps. Many Americans resent this deeply. Many are very very committed to being sure that no one "gets away" with this $43.78, especially anyone who is here from South of the Border. All Americans should read this book about "those people." It presents a series of interconnected stories about a family who came to the U.S. to get services for their injured child, a family According to our government, every American who earns $50,000 a year contributes $43.78 to welfare and food stamps. Many Americans resent this deeply. Many are very very committed to being sure that no one "gets away" with this $43.78, especially anyone who is here from South of the Border. All Americans should read this book about "those people." It presents a series of interconnected stories about a family who came to the U.S. to get services for their injured child, a family who came because of violence in their home town, a woman who came because she loves movies and will never be able to be a star at home, a man who sends money for his sons to go to school. Some are "legal." Some are not. Some are from Mexico, some from Guatemala, some from Panama…the people commonly lumped together as a single, uniform group. Their stories are as varied as those of any group of people who operate on the hope that things will get better…if not for them, then for their children. At the core of this books is a love story, a tender heart breaking love story that makes all of the other stories even more real. More than anything, I appreciate the fresh perspective and the eye-opening nature of this story. Immigration is a sensitive topic and a political platform in our country right now, there’s no denying that. Don’t worry, I’m not going to try and tackle that issue in this review. What I will say - I walked away from this story looking at things a little differently. It made me feel like the human aspect of the situation is too easily overlooked. I think we forget that some of these immigrants are ju More than anything, I appreciate the fresh perspective and the eye-opening nature of this story. Immigration is a sensitive topic and a political platform in our country right now, there’s no denying that. Don’t worry, I’m not going to try and tackle that issue in this review. What I will say - I walked away from this story looking at things a little differently. It made me feel like the human aspect of the situation is too easily overlooked. I think we forget that some of these immigrants are just people looking for a better life - a way to take care of their families. That’s the case for the Rivera’s, at least. They leave behind their extended family, their home, the husband’s business; all in an effort to get their daughter some help. They’re willing to sacrifice everything to give Maribel the opportunity to attend a special school. A school that could help her make progress after suffering a traumatic brain injury. The family ends up in an apartment building in Delaware that’s solely occupied by hispanic immigrants. The author weaves in a few chapters from each of those immigrants, a backstory of sorts on how they ended up in America. I thought it was an interesting touch. There’s a complexity to her characters that not every author manages to pull off and it did what I assume she set out to do, added more heart to the story. I have to mention, I wasn’t Mayor’s biggest fan. I didn’t buy the love story aspect. A part of me felt like he was taking advantage of Maribel somehow. Did she truly understand what was happening? What really struck me was how this family had to essentially let go of a part of their culture. Even simple things, like having to eat processed foods because they couldn’t afford to buy the things needed for the recipes they've been eating for their entire lives. This story also made me consider just how hard it would be to live somewhere where you couldn’t understand the language, making it almost impossible to communicate. Can you imagine? How would you ask for help? At one point, Alma gets lost and struggles to figure out how to get home. I was panicking for her. 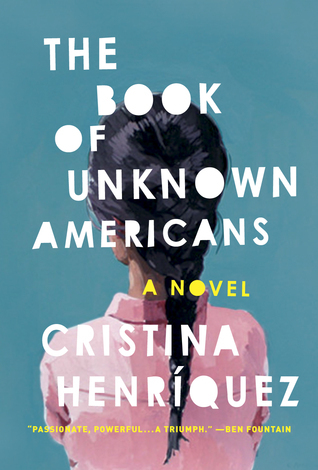 The Book of Unknown Americans by Christina Henriquez is a 2014 Knopf publication. I’ve been looking to expand my reading repertoire lately, so while browsing through the literary offerings, I came across this book. Checking this book out is like doing a 180 for me as I usually stick pretty close to my preferred genres. But, something about it spoke to me and so I decided to give it a try. 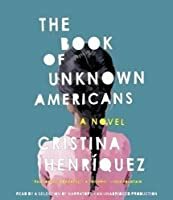 So often we hear about laws, and issues, and the numbers surrounding immigration without stopping to consid The Book of Unknown Americans by Christina Henriquez is a 2014 Knopf publication. So often we hear about laws, and issues, and the numbers surrounding immigration without stopping to consider the human element. This book puts names with faces, and finally humanizes the population of people who come to this country for various reasons, hoping for a better way of life. When Maribel Riveras suffers a traumatic brain injury, her family moves to America to enroll her in a special school in hopes she will eventually regain all she lost in the accident. Fifteen year old Mayor Toro has lived in America his entire life, but his family is from Panama. He and Maribel strikes up a friendship which eventually turns into a sweet and tender love story while their parents struggle with the decision they made to make America their home. While the topic of immigration is one that is sure to spark instant and heated debate, especially during an election year, this book is not a political novel, it is just a story that paints a vivid portrait of the way of life many immigrants face after moving to America. There are inspired moments amid the bittersweet and poignant realities, and will really make you stop and consider things from an entirely different perspective. I admired the families that were represented in this story, and recognized in them the same qualities as most Americans possess. They worked hard to provide for their families, they had hopes and dreams, went through good times and bad, but mostly they wanted to give their children a better way of life, something which I think we all strive for. The love story between Maribel and Mayor is especially touching and despite the animosity and stubbornness, his father exhibited, Mayor followed his heart, and his attention to Maribel was what brought about the biggest improvements for her. Although the story was not necessarily one that left me feeling upbeat or all that hopeful in the end, it did enlighten me, and is very thought provoking. I can see why this story as garnered such critical acclaim and I have to say I am pleased I took a chance on it. I’ve waited to post a review of this novel as I try to wrap my mind (and words) around why I liked it so much. This book wants to be a lot of things – love story, issue-oriented novel, independent essays – which should make it a mess, but somehow all work together to make a book that really touched my heart. The story is told in alternating voices as we meet the residents of an apartment building in Delaware. All the residents are immigrants and all are Spanish-speaking despite their origins in m I’ve waited to post a review of this novel as I try to wrap my mind (and words) around why I liked it so much. This book wants to be a lot of things – love story, issue-oriented novel, independent essays – which should make it a mess, but somehow all work together to make a book that really touched my heart. The story is told in alternating voices as we meet the residents of an apartment building in Delaware. All the residents are immigrants and all are Spanish-speaking despite their origins in multiple different countries. The bulk of the story, its heart really, is a love story between Panamanian Mayor, whose family has been in the U.S. since he was a few years old, and Maribel, a beautiful but brain injured girl whose family has made the journey from Mexico so she can have a better education. Their journey together, with all its ups and downs, challenges and epiphanies, is the stuff of great YA fiction. But Henriquez does not stop with the love story. She delves deeper into the lives of their parents and their neighbors. We get to know these immigrants, some of them citizens, some of them illegal in their own voices. This is tricky as Henriquez inhabits over a dozen voices, men and women, young and old. Obviously immigration is a very sensitive political subject and one that’s deeply personal as my father was born in Mexico and came to Chicago as a very young boy. Henriquez does an excellent job of presenting these characters and the issues they face without coming down hard on any side of the political debate. Her characters are simply human. "I felt the way I often felt in this country -- simultaneously conspicuous and invisible, like an oddity whom everyone noticed but chose to ignore." “That first day, the words were merely sounds in the air, broken like shards of glass, beautiful from a certain angle and jagged from another." "People do what they have to do in this life. We try to get from one end of it to the other with dignity and with honor. We do the best we can." I was touched and moved by the small stories and the central families is this lovely novel. This book could have been so much better than it was. As it is, it's a trainwreck. The only reason I gave it two stars instead of one is simply because it's bizarrely readable even in spite of the very little substance there is at hand. Where do I even begin with this books issues? The rhythm the book sets into -- Alma-narrated chapter, Mayor-narrated chapter, and brief bio of a tertiary character -- had potential. Yet the tertiary characters' chapters all read painfully alike, with seemingly the This book could have been so much better than it was. Where do I even begin with this books issues? The rhythm the book sets into -- Alma-narrated chapter, Mayor-narrated chapter, and brief bio of a tertiary character -- had potential. Yet the tertiary characters' chapters all read painfully alike, with seemingly the only thing changed the character's respective nationality. Mysteriously, Henriquez ignores all differences between each country; there's nothing particular Nicaraguan about Benny or Venezuelan about Quisqueya. This device was probably aiming to establish some sens of a pan-Latino identity, but you don't do that by ignoring difference -- you do that by embracing it. Alma had potential as a character, but as a central character to the book, she is perhaps childishly optimistic and at first completely oblivious to the country she is living in. As a child of Latino immigrants and a friend to many Latino immigrants, this couldn't ring more false. Some of the cultural differences she is unaware of are frighteningly simple! Where does she shop for groceries? How does she spend money? Correct me if I'm wrong, but I'm pretty sure there are supermarkets with fixed prices in Mexico. Similarly, Mayor is likeable -- but to use first person perspective with him simply did not work. Mayor's narration is actually very similar to what I'd expect someone his age and with his cultural background to sound like. The problem is that just isn't very interesting to read. The weird romantic twist his chapters took was creepy, not in the least because he seemed to be praying on a girl with a traumatic brain injury. Worst of all, though was the bizarre and sudden melodramatic turn in the novel's final third. A more experienced writer could have handled this with grace, but here it simply comes across as needlessly preachy and unnecessarily condescending. This book is told through many points-of-view, but in the book they all end up overlapping somehow. One family moves to the USA from Mexico after their daughter suffers a near-fatal accident. Their daughter ends up having a Traumatic Brain Injury. The family moves so she can go to one of the best special education schools. They settled down in the Redwood Apartments, a two-story cinderblock complex just off a highway in Delaware. This is where they experienced great friendship and great heartache. The daughter, Maribel, becomes friends with Mayor Toro, who also lives in the Redwood Apartments. He is a high school sophomore whose family arrived from Panamá fifteen years ago. Mayor sees in Maribel something others do not: her personality and her potential. this book features a panamanian boy. central america is not something you see being featured in books. nobody really knows about us. no one knows about us salvadoreños (que viva mi pulgarcito). i don’t even care if nobody has read this. i don’t even care if any of my friends here have read it and didn’t enjoy it. i just got so happy when i saw this for latin america representation. because yes, hEEEYYY!!! central america !!! is a 7-country spanish-speaking region !!! we ! need ! more ! central ! american ! representation ! 3.5 The immigrant debate and the need for immigrant reform is an issue that has been the forefront of the news in The United States for a number of months. I am not going to give my own opinion on this debate, only mention it as it refers to the timeliness of this novel. The book mostly centers on two families, one who come to the US from Panama and the devastation wrought by the invasion of the US in 1989 and the other family who come from Mexico in order to get the help and schooling their brai 3.5 The immigrant debate and the need for immigrant reform is an issue that has been the forefront of the news in The United States for a number of months. I am not going to give my own opinion on this debate, only mention it as it refers to the timeliness of this novel. The book mostly centers on two families, one who come to the US from Panama and the devastation wrought by the invasion of the US in 1989 and the other family who come from Mexico in order to get the help and schooling their brain damaged daughter needs, following a horrible accident. These families settle, with other families from many different counties, in an apartment building in Delaware. There they try to make friends and a community with others like themselves. The author does a wonderful job highlighting the difficulties of these immigrants, who when first arriving speak no English and must trust in those said to be helping them. They are also notoriously easy to being taken advantage of, as many seem willing to do. The price of things are often a shock, the food so different from what they are used to, the work they are given and the salary they make is below par, to say the least. They are always a moment away from disaster, financially and emotionally. This novel gives one a great deal to think about, an opportunity to experience the many different ways these new immigrants try to fit in, how desperately they want to be considered Americans. The romance between the one family's daughter and the son of the other, is almost too sweet, but maybe given the circumstances, understandable. It is a romance that will cause disaster, and a profound change in circumstance. I would have liked to have seen and felt more tension and depth, but despite that this is a worthy, and as mentioned previously, a timely read. Many other characters tell their stories in this novel, so one does get a cross section of many different stories and the many different reasons they come to the US. There is very little fiction covering the contemporary Latino immigrant experience so this book may have made the 2014 New York Times Notables List for its content. While the story is good, there is no subtly. The author's purpose may be to show the goodness of the "unknown Americans", but the characters are not well developed and the details of their lives are not realistic. Can it really be that a successful couple in Mexico who has researched US schools for special needs students, found a job There is very little fiction covering the contemporary Latino immigrant experience so this book may have made the 2014 New York Times Notables List for its content. While the story is good, there is no subtly. The author's purpose may be to show the goodness of the "unknown Americans", but the characters are not well developed and the details of their lives are not realistic. Can it really be that a successful couple in Mexico who has researched US schools for special needs students, found a job near that school, figured out the visa system, and arranged an apartment has not prepared themselves for their trip with even a few phrases of English? When they moved their household in a truck, did they really have room to acquire a TV and a mattress along the way? Can a diner cook really support a family of four in a single household? These are only a few of the problems in realism with this book. The author shows several instances when parents keep their children in the dark. Rafael was not direct in telling Major want he learned at school. Alma does not help Maribel understand the assault. At the end Alma leaves Maribel guessing about something significant and life changing for her about her father, which Maribel (probably because she was kept in the dark) had not even considered at that point; Rafael leaves his son guessing about Maribel's father for far too long. A number of first person narratives are used, perhaps to fit the title, but they do not relate to the story. Space devoted to this would have been better used in developing the characters and showing perspective on the culture and the family dynamic. Updated to 4 stars. I didn't want this book to end. I wanted to follow the characters and see where the rest of their lives took them. I recommend this one. We have some re-occuring POVs from the Main Characters intertwined with vignettes from some of the side characters. I loved all the MCs and their stories felt incredibly real and raw. I felt like these could have been real people and it made the stories much more gripping as well. Arturo and his family move to America in order for his daughter Maribel to attend a special needs school. She was mentally injured in accident and changed completely from a vibrant full of energy girl to someone who barely speaks and has an attention deficit. They decide the best way to encourage recovery is to attend an American school, hoping that in the process they will get their old daughter back. There they meet and befriend different families of immigrants from Panama, Mexico, Guatemala who have their own interesting backstories and reasons for imigrating. The majority struggle with low-paid jobs and not ideal financial situations. I guess this spoke even more to me due to being an immigrant myself (and my family as well actually) so I know what it is like to be a stranger in a country very different to your own. Originally from Eastern Europe I ended up living in both England and Spain so I felt their pain in remembering with nostalgia their home country as well as the racism towards you that seems unavoidable wherever you go. Very much so. Arturo and Alma´s story went straight to my heart, their pain was raw and visceral. I wish I could say this was a light hearted novel just so that all of them end up happy but this was nothing like that. It takes you places you didn´t really expect and the topics it covers are not light but are necessary. That doesn´t mean eveything is bleak! It has some powerful tender moments that will make you smile and warm your heart and soul but just as life is, it´s not all there is. Loved the romance beteen Mayor and Maribel. They saw each other for who they really were and were incredibly sweet and I wish their parents could have seen just how much they needed and helped one another. Even the older couples were interesting to read about though it included a lot of sexism coming from the culture seeping through in their relationship. Another book I tore through in just a couple of sittings. Henriquez starts with what appears to be a simple love story between two teens and weaves in multiple stories of immigrants from all over Latin America. The result is a much larger love story, between the two teens' families and between the immigrants and the United States itself. Alma and Arturo come from Mexico to Delaware, of all places, in the hopes that their brain-damaged daughter, Maribel, can get better help at a special needs school in the U.S. Their story is interspersed with testimonials from men and women from Puerto Rico, Nicaragua, Paraguay, Panama and other places. All of the stories and vignettes combine into a whole that tells the tale of one immigrant community in America and the struggles they face trying to assimilate. While enlightening and interesting Alma and Arturo come from Mexico to Delaware, of all places, in the hopes that their brain-damaged daughter, Maribel, can get better help at a special needs school in the U.S. Their story is interspersed with testimonials from men and women from Puerto Rico, Nicaragua, Paraguay, Panama and other places. All of the stories and vignettes combine into a whole that tells the tale of one immigrant community in America and the struggles they face trying to assimilate. 1) I listened to it the first time; this time I'll read the book. I finished this book and wrote my review on my mobile device. Unfortunately, that device has gone the way of the dinosaur and my notes didn't make it to the cloud in time. I loved this novel of various immigrants from all over Latin America living in an apartment complex in Delaware. Immigration is a subject I'm very passionate about. Some of the characters are visited repeatedly and we get to know them very well. A few are single, brief encounters. One of those single stories elevated this to a 5-star novel for me. It should be required reading for all. I will reread this one soon and perhaps update my review. Meanwhile: highly recommended! One more thought: I read this while enjoying the lovely people and scenery of Mexico. At one point, we met a guy who spoke flawless English. I asked him where he learned to speak. Over the course of the evening I found out that he had been born in Mexico, but moved with his parents to Texas when he was still a baby. Three years ago, as a teenager (17-18? ), he was sent back to Mexico. All of his siblings, who were born in the US, were allowed to stay, but he was not. He hasn't seen his mom, dad, or siblings since then! The sadness that emanated from him by the time he had shared this was heartbreaking. I wish I could help him somehow. How does this happen? It is so wrong. At the heart of The Book of Unknown Americans are the Riveras, who managed to secure work Visas after their 15-year-old daughter, Maribel, suffered a traumatic brain injury in Mexico. With legal authorization to work in the U.S., Arturo and Alma Rivera move to Delaware to be near a special-needs school that they hope will help restore their daughter to the lively teenager she once was. In that small, cold, and bleak city in Delaware, the Riveras hope to start a new life. Their new apartment may be small and rundown, and Arturo may only work in a damp and dark warehouse picking mushrooms for a living, but at least Maribel will have a better life in America. Or so they think. The narrative is divided into several different point of view chapters. Alma is clearly the central character, but a Panamanian teenager, Mayor, also narrates a large part of the story. Upon seeing Maribel for the first time, Mayor is initially struck by her beauty and becomes enchanted with this young mysterious and stoic girl. However, the love that will eventually develop between them will be complicated by the reality of Maribel's condition. In fact, much of the drama will revolve around the complications their relationship will create. Interspersed throughout the novel are short chapters that allow the various characters we meet throughout the story to come to life in their own words and lend their voice to the narrative of the immigrant experience.These short chapters are what give the book its name and they provide a rebuttal to anti-immigrant rhetoric that is only intensifying in American. All the narrators are neighbors of the Riveras who live in the same apartment complex and they hail from all over Latin America. Below is a snippet narrated by one such neighbor, Micho Alvarez. We're the unknown Americans, the ones no one even wants to know, because they've been told they're supposed to be scared of us and because maybe if they did take the time to get to know us, they might realize that we're not that bad, maybe even that we're a lot like them. And who would they hate then? However, despite how much I enjoyed these chapters, I must admit that some of them felt unnecessary. They were moving and beautifully written as well as entertaining, but they did no progress the plot and often appeared to be sanitized accounts with the aim of providing a palatable story of the "model immigrant." These characters could have been humanized to better effect by serving more important roles in the actual plot of the novel instead of serving as the content filler it seemed to be at times. This story recounts the immigrant experience of a vast array of Latinos on the eastern central coast of America, in Delaware. It moves in for close-ups of two families in particular, one Panamanian and one Mexican. Both families are legal immigrants, one coming to the United States for medical care, the other for opportunity. Christina Henriquez manages to make the experiences of these two families ring true and universal. Especially interesting was the voice of Mayor Toro, teenager and younger This story recounts the immigrant experience of a vast array of Latinos on the eastern central coast of America, in Delaware. It moves in for close-ups of two families in particular, one Panamanian and one Mexican. Both families are legal immigrants, one coming to the United States for medical care, the other for opportunity. Christina Henriquez manages to make the experiences of these two families ring true and universal. Especially interesting was the voice of Mayor Toro, teenager and younger brother to a high school soccer star. He had a lot to live up to, and his vulnerability was everywhere apparent. His interest in a beautiful but brain-damaged young woman, Maribel, in a nearby apartment led to unforeseen and tragic consequences. The chain of events had a kind of logic to them that began in ignorance and fear, and were sustained by the well-known uncommunicativeness of teenagers. Henriquez’ use of first-person narration, changing the ‘voice’ from one chapter to another, gave the piece immediacy and truthfulness. Often we can hear an individual thinking and speaking; the overlapping points of view give the story tension and the listener can see a crisis foreshadowed long before the conclusion is revealed. The final chapter is given finally to the father of Mexican family who reveals his pleasure in the struggle they have undergone, despite its many disappointments. I listened to the audio of this book, performed by an array of narrators and produced by Random House Audio. I was offered this title by Random House in exchange for an honest review. Soooo I wrote an entire review of this book and Goodreads crapped out on me when I hit save. Excuse me while I cry forever. - Alma's chapters were definitely my favourites. They gave me a lot of feels. - Mayor's chapters were...kind of a mixed bag for me? I mean, I really liked his perspective. But. He's a typ Soooo I wrote an entire review of this book and Goodreads crapped out on me when I hit save. Excuse me while I cry forever. - The chapters from the perspectives of the various characters living in the apartment building were wonderful, though at times they felt ever so slightly repetitive. - I was........uncomfortable........about Mayor's physical relationship with Maribel at times. He'd say things like "I could tell she was into it" or "I knew she felt it too". But, like, Maribel has an acquired brain injury. She's incredibly passive as a result of it. Mayor knows this. So, like, USE YOUR WORDS, SON. Make 100% sure that she's into it, don't just assume. I wanted to love this book more than I did. It’s the story of the Rivera family, who come to the US from Mexico, in hopes of finding some better treatment for their teenage daughter, Maribel, who suffered a traumatic brain injury after an accident. It’s also the story of the Toro family from Panama, who came to America to seek a better life. When Mayor Toro and Maribel Rivera meet and start a relationship, they set in motion events that will greatly impact both families. This book is wonderful i I wanted to love this book more than I did. This book is wonderful in describing the immigrant experience, especially how bewildering America can seem to someone who has just arrived from another country, in particular if they don’t speak English. Interspersed amid the main story are the stories of the other residents in the apartment building, all from Latin American countries. Although interesting, I felt that they interrupted my focus on the main story. At times I had trouble keeping the characters straight, because all of a sudden I had to focus on a seemingly minor character and I would lose the thread of the story. Eventually I got used to it, but it took me a while to get into the book. Although the main characters were the Rivera and Toro families, I didn’t feel they were fully formed as characters. They just felt flat to me, which may be another reason why I had trouble connecting with them and keeping them straight. It’s also interesting that you get everyone’s point of view but Maribel’s. Although somewhat brain damaged, it would have been fascinating to see how she viewed events, given how much the story hinges on her. I will say that the book is beautifully written. At times the prose is just lyrical. But that said, I just couldn’t connect with the characters or the story. It’s never a good sign when you are relieved that you have finally finished a book. This was a 4.5 read for me. This book is definitely a contender for a top read for me. Every now and then I read a book that just touches my heart. The Book of Unknown Americans is such a book. From the first pages I was captivated by the sustained voices of the characters written with such grace and dignity as I felt their humanity, hopefulness, and despair to do what they had to do ensure a better life for their children and often, times themselves. I so enjoyed how the author connects the reade This was a 4.5 read for me. Every now and then I read a book that just touches my heart. The Book of Unknown Americans is such a book. From the first pages I was captivated by the sustained voices of the characters written with such grace and dignity as I felt their humanity, hopefulness, and despair to do what they had to do ensure a better life for their children and often, times themselves. I so enjoyed how the author connects the reader to the characters. As we follow the Riveras journey, meeting the Toros and other Central and Latin American immigrants we learn of their plights realizing these are slices of life that happen universally. But because of who these immigrants are often times they are defined by preconceived notions not as individuals. For me the interesting title is summed up by one of the characters. Henriquez’s masterful story is compassionate, courageous and creative. The compelling characters encapsulate the undulating sweet-and-sour spectrum of life and will stay with you after turning the last page. I recommend this book to readers who are looking for an entertaining yet thought-provoking read. I read this book with the Writers of Color Book Club and I have to say, I am on the fence about this one. On one hand, the book was interesting due to it's cast of characters who all had a voice and the issues of immigration and how Latinos are seen in America were really intriguing to me since I very rarely see books written from this demographic of people in my TBR pile. Yet, I felt like the execution of the book was at odds with the story. For me, the story put me in mind of more diverse versi I read this book with the Writers of Color Book Club and I have to say, I am on the fence about this one. On one hand, the book was interesting due to it's cast of characters who all had a voice and the issues of immigration and how Latinos are seen in America were really intriguing to me since I very rarely see books written from this demographic of people in my TBR pile. Yet, I felt like the execution of the book was at odds with the story. For me, the story put me in mind of more diverse version of Eleanor & Park by Rainbow Rowell. It almost seemed as if the characters of Mayor and Maribel were mirror images of Eleanor and Park, but the added twist was that Maribel is mentally handicap. Add to this star-crossed love story the fact that the author never really pins down a solid main character and adds in random chapters that are told from the voice of various people in Mayor and Maribel's neighborhood and it's almost like the book really does become just a compendium of "unknown" or lost immigrant Americans. This in itself wouldn't be so bad if the other voices tied into the central storyline better. Instead, they just felt like filler to me that served no real purpose in the overall storyline. (view spoiler)[Not to mention, the ending in the book sucked! I was all set to...actually I'm not sure what I was expecting to happen, but the story just felt so undone and wrong and mismatched to me overall so I can't exactly place the full blame on the ending for why this book wasn't rated higher. (hide spoiler)] In a sense, I think my low rating has to do with the fact that I saw loads of potential in the book, but Henriquez just never seems to deliver on it. "People do what they have to in this life. We try to get from one end of it to the other with dignity and with honour. We do the best we can." You will never fully know what people are trying to overcome. It’s hard to make it in the world as is, even harder in a place that makes you feel less than who you are. But at the end of it all, "they might realize that we're not that bad, maybe even that we're a lot like them. And who would they hate then?" The Book of Unknown Americans is a story that l "People do what they have to in this life. We try to get from one end of it to the other with dignity and with honour. We do the best we can." Excuse me, I think I have something in my eye. Or there’s an onion chopping ninja floating around somewhere who was cutting those suckers when I was reading this book. Because it was just so beautiful. While the story follows an apartment complex made up of mainly Latino immigrants in Delaware, the main focus of this story revolves around two families; The Riveras and the Toros. Maribel and her family have immigrated from Mexico to hopefully receive medical treatment after a serious accident requires her to have brain surgery not available in her home country. Mayor Toro and his family immigrated from Panama several years ago, and have been fairly successful in living the American dream. But that same dream that seemed so close will soon become much farther from their reach than any of them have ever imagined. Told through multiple perspectives from both families and other immigrants in similar circumstances, this book fully captures the immigrant experiences and prejudices today. Reading can be an escape from reality, but sometimes, we need to let books have us look at the cold, hard reality we’re living today. And this book does exactly that.Through Maribel and Mayor, we get to see their trials, triumphs, and experiences as immigrants in the United States. I kind of liked the fact that the author chose to set the book in a state not associated with copious amounts of Latino immigration. I live in an area/state where immigration is common, so it would seem typical that a story about this subject matter would be set in California or another border state. By setting the story in Delaware, we can see the stark contrast between states that have a lot of Latino immigration and states that don’t, making the experience all the more scary and isolating to the Riveras and Toros. Another surprising thing that I encountered was the authors portrayal of not only white prejudice and stereotypes against Latinos, but Latino stereotyping against Latinos (and other racial minorities). This humanized them for me, as I think we tend to forget that minorities tend to have stereotypes about not only white culture, but their own as well. Living up to these Latino stereotypes is something Mayor struggles with, as he’s not the macho, soccer playing Latino male his father wants him to be. Oh no; he’s more focused on Maribel, the pretty new neighbor. He’s immediately attracted to her in the way only a teenage boy could be. Despite this, he falls hard for her, and their romance was rather sweet. It was raw and real in the way teenage love tends to be, no matter if you were born here or anywhere else. I did like the multiple perspectives of this book, I do think that the author needed to compromise some of the sections. What I mean is this: pretty much everyone from the building got at least one chapter in the book to tell their background, where they came from and how they came to America? Do I think it was necessary? Probably, to give more insight to the characters. However, I think the author could have combined some of the character’s chapters or at least intertwined them with the main narratives. Having just one chapter devoted to the side characters made me wish for more about them, and it also felt like a waste to have such brief words written about them. During political times such as this, books like these really hit home. With all the problems and debates we’re having with immigration (not just here, but in Europe especially), hearing from the other side of the story will help us understand their perspectives and hopefully squash the stereotypes surrounding them. Reade it and weep, friends. One of the things that initially drew me to this book is that it takes place in my hometown of Newark, Delaware. Throughout I enjoyed references to local landmarks such as Bings Bakery and Newark Newsstand. However, as Henriquez gently revealed the characters' struggles and hearts, I forgot about the setting and became absorbed with the narrative. There were a couple things that set this book apart from most I've read about the immigrant experience. Arturo, Alma and Maribel, one of the families One of the things that initially drew me to this book is that it takes place in my hometown of Newark, Delaware. Throughout I enjoyed references to local landmarks such as Bings Bakery and Newark Newsstand. However, as Henriquez gently revealed the characters' struggles and hearts, I forgot about the setting and became absorbed with the narrative. There were a couple things that set this book apart from most I've read about the immigrant experience. Arturo, Alma and Maribel, one of the families at the center of the story, did not leave Mexico looking for a better life. They had a comfortable life in Mexico which they left only because they wanted a specialized school for their 15 year old daughter Maribel, who had suffered a brain injury when she fell off of a ladder. Arturo did whatever he could to support his family but had a tough time fitting into a new culture where he did not know the 'rules'. From pulling mushrooms in the dark for ten hours a day to navigating grocery stores, life was a daily struggle. It was this family that was by far the most engaging to me. Also living in the apartment building ("cinder block hive")were the Toros from Panama. Celia, the mother, befriends Alma and introduces her to Coca-Cola among other things. Mayor, her son, falls in love with Maribel which leads to both tender scenes and some hair-raising ones which I won't spoil. Other families share their stories briefly to broaden the reader's perspective. For me, less would have been more. Just let me enjoy getting to know the two main families and don't bother a bit trying to round out my perspective. Other books can do that. I also felt that Maribel learned very quickly how to process a joke, comprehend text, follow prompts, and focus for longer time periods. I too have a mild traumatic brain injury and I find it unlikely, even with her youth on her side, that she could have relearned so much so quickly and with so little frustration. In my experience, cognitively disordered brains struggle and stumble and hiccup, never again taking memory or previously learned knowledge for granted. Perhaps, I'm trying to make my experience universal which is just as ridiculous as thinking that each immigrant's experience is similar. All in all, I enjoyed the writing and storyline and was absorbed in the book. I spent time thinking about the people I encounter who might feel invisible, unknown, unappreciated. Sometimes it's just a smile that makes a difference in someone's day. Arturo says toward the end of the book, "People do what they have to in this life. We try to get from one end of it to the other with dignity and with honor. We do the best we can." Arturo and Alma Rivera lived a happy life in Mexico until their beautiful teenage daughter, Maribel, sustains a serious injury in an accident. Unsure if she'll ever be the same again, they migrate to the United States—Delaware, specifically—where Maribel will be able to attend a special school and hopefully begin to recover some semblance of normalcy. But America is difficult for the Riveras—the job Arturo secures to sponsor their journey to America is brutal, Maribel doe I'd rate this 3.5 stars. Arturo and Alma Rivera lived a happy life in Mexico until their beautiful teenage daughter, Maribel, sustains a serious injury in an accident. Unsure if she'll ever be the same again, they migrate to the United States—Delaware, specifically—where Maribel will be able to attend a special school and hopefully begin to recover some semblance of normalcy. But America is difficult for the Riveras—the job Arturo secures to sponsor their journey to America is brutal, Maribel doesn't seem to be making much progress in school, and Alma struggles with English, and trying to become acclimated to a different life. "Because a place can do many things against you, and if it's your home or if it was your home at one time, you still love it. That's how it works." The one bright spot is that the Riveras meet Celia and Rafael Toro, who came to the U.S. years ago to escape the destruction and violence in Panama. The Toros are more settled into their American lives, although Celia in particular longs to return home, at least for a visit. And when their teenage son, Mayor, who struggles with self-confidence in the shadow of his more athletic, popular older brother, sets eyes on Maribel for the first time, he finds himself completely in her thrall, and wants nothing more to spend time with her, despite what others perceive as her challenges. As the relationship between the Riveras and the Toros grows stronger, it is tested—as are relationships within each family—by secrets, incorrect assumptions, fears, longing, and struggles. And a number of incidents occur which set in motion a chain of events which will affect each member of both families in vastly different ways. Cristina Henriquez's The Book of Unknown Americans gives a powerful and moving glimpse into the immigrant experience for many Latin American people. In addition to telling the story of the Rivera and Toro families, the plot is interwoven with brief testimonials from other neighbors, each of whom came from a different Latin American country and experienced different struggles and happinesses upon arriving in America. This is a book that makes you think a little bit more about the challenges and barriers people often deal with when coming to America, even legally. The title of this book is perfect because it is for all the people who have come to the United States, with a dream of a better life, but whose faces, voices, somehow get lost in the face of so much discrimination. But they do have a voice, they have a story to tell. They suffer pain, love as hard, laugh in happiness, the same as you and I. We really are not so different when we get to the core of it. As parents we all want to give our children a better life and we will make any sacrifice in ord The title of this book is perfect because it is for all the people who have come to the United States, with a dream of a better life, but whose faces, voices, somehow get lost in the face of so much discrimination. But they do have a voice, they have a story to tell. They suffer pain, love as hard, laugh in happiness, the same as you and I. We really are not so different when we get to the core of it. As parents we all want to give our children a better life and we will make any sacrifice in order to do so. That is what Alma and Arturo Rivera do for their daughter Maribel after she suffers a tragic accident that leaves her brain damaged. They leave their lives behind in Mexico and come to the U.S. so that Maribel can attend a school that will help her. Their life in the U.S. is not easy, but they are willing to make a new life here. In the apartment complex they live resides the Toro family, from Panama. They have a son Mayor, who befriends Maribel. The two eventually fall in love and what happens on a tragic night will bring up questions of blame and living with the choices they make. The story felt very personal to me. I know many of these voices. Their stories touched my heart. I was afraid at first that the story was going to turn out to be gimmicky with the intercepting stories of side characters, and although I wanted to learn more about particular characters , the story never strays far from its main focus. I could not put this book down and I look forward to more of this author. This only made me realize how important it is to put down my own personal family stories to paper, even if it’s for the sole purpose of passing these stories down to more generations. Cristina Henríquez is the author of The Book of Unknown Americans, which was a New York Times Notable Book of 2014 and one of Amazon’s Top 10 Books of the Year. It was the Daily Beast Novel of the Year, a Washington Post Notable Book, an NPR Great Read, a Target Book of the Month selection, and was chosen one of the best books of the year by BookPage, Oprah.com, and School Library Journal. It was Cristina Henríquez is the author of The Book of Unknown Americans, which was a New York Times Notable Book of 2014 and one of Amazon’s Top 10 Books of the Year. It was the Daily Beast Novel of the Year, a Washington Post Notable Book, an NPR Great Read, a Target Book of the Month selection, and was chosen one of the best books of the year by BookPage, Oprah.com, and School Library Journal. It was also longlisted for the Andrew Carnegie Medal for Excellence in Fiction and was a finalist for the Dayton Literary Peace Prize. Henriquez is also the author The World In Half (a novel), and Come Together, Fall Apart: A Novella and Stories, which was a New York Times Editors’ Choice selection. Her stories have been published in The New Yorker, The Atlantic, Glimmer Train, The American Scholar, Ploughshares, TriQuarterly, and AGNI along with the anthology This is Not Chick Lit: Original Stories by America’s Best Women Writers. Cristina’s non-fiction has appeared in The New Yorker, The New York Times Magazine, The Wall Street Journal, Real Simple, The Oxford American, and Preservation as well as in the anthologies State by State: A Panoramic Portrait of America and Thirty Ways of Looking at Hillary: Women Writers Reflect on the Candidate and What Her Campaign Meant. She was featured in Virginia Quarterly Review as one of “Fiction’s New Luminaries,” has been a guest on National Public Radio, and is a recipient of the Alfredo Cisneros Del Moral Foundation Award, a grant started by Sandra Cisneros in honor of her father.